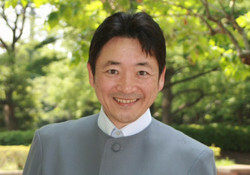 Yuu Mizushima is a veteran voice actor in Japan, famous for his role as Toshio Otomo in Studio Pierrot's Creamy Mami, the Magic Angel. He was born in Tokyo, and his favorite foods are watermelon, grapes, eggplant with miso (nasu dengaku), and rice with egg (tamago kake gohan). He can act any role, from young hero to villain; some of his main roles include Isamu Kurogane from Beast King GoLion, Telemaque from Uchuu Densetsu Ulysses 31, and he starred as Kyosuke Kasuga in the pilot episode of Kimagure Orange Road. He also does voice-over work for the Hong Kong actor and martial artist, Sammo Hung.